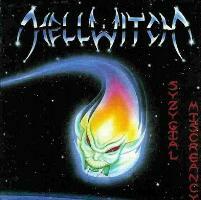 This album called ’Syzygial Miscreancy’ by Hellwitch is a re-release originally released back<?xml:namespace prefix = o ns = "urn:schemas-microsoft-com:office:office" /> in 1990. This re-release includes 12 bonus tracks, all pre-album demos. A 20 page booklet with lyrics, liner notes and lots of rare photos. And... the band is reformed and should have a new album out this fall. Well... I simply swallow almost everything when it comes to thrash metal music and the same goes for Hellwitch. Their music is a mix of Atheist, Death and even Violence but Hellwitch’s music is more schizophrenic in some way. The music is packed with twists and turns and most of the tracks needs a few spins to grow. But soon it will be creeping up on you and tracks such as; “Viral Exogence” and “Sentient Transmography” turns into very enjoyable tracks, mostly because of the fast yet wicked guitar runs. The demo bonus tracks is for Hellwitch fans only I think. The production is not perfect and most of the songs are from the original album. So for fans only. ’Syzygial Miscreancy’ is not an album that will find its way into my player every single day, but I’m sure that I will dust if off now and then.